What is better than a good Summer road trip? You get to explore new areas every day, and you get to set the pace for your activities. 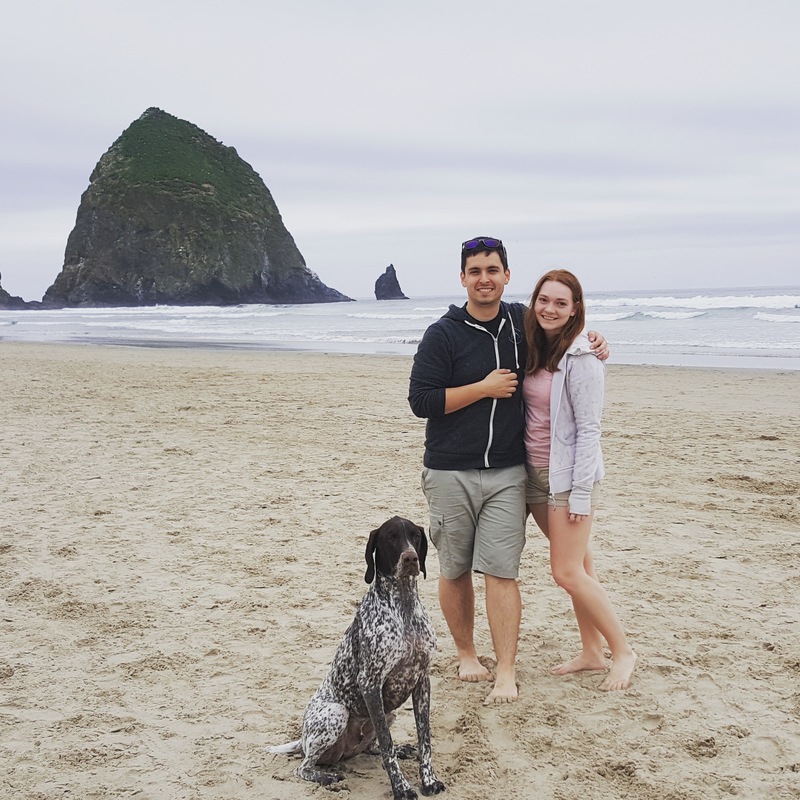 In my little family Summer has become synonymous with road trips, and our favorite route is from our home in Seattle all the way to somewhere in Southern California. While the sighs and attractions we see each time change, the reasons why we take this road trip year after year do not. Here are my 8 reasons that I hope will convince you to take a US West Coast road trip! Road trips mean camping, and there is no better camping than spots next to the ocean. Our trip started in Seattle, where we made it to the coast via Cape Disappointment. An unfortunate name given to the most South Western corner of Washington State, this state park has views of insane crashing waves and a long and quiet beach. There is a handy highway that you can begin here that will take you all the way through Oregon: Highway 101. Haystack Rock in Cannon Beach is a sight not to be missed! Our first night was spent camping at Cape Lookout State Park. At $30 for a non-powered campsite, it is a steal. You fall asleep to the sound of crashing waves and you are always less than a five minute walk from the beach. Camping on this road trip was amazing because of the sites we were able to book. There is nothing quite like falling asleep to and waking up surrounded by the sounds of the ocean. Day Two was all about uncovering new gems along the Oregon Coast. This was the first time we would be following the 101 all the way to the California border, and we planned to stop everywhere the daylight would allow. Although the day started off rainy, we were determined not to let that ruin our time together. Because Adrian and I spent two and a half years living on almost opposite sides of the continent, our time together really mattered. We used this time to road trip together and make amazing new memories. The day was filled with some awesome things. I finally found sea stars in some tide pools (after years of dutifully searching!) We discovered a pristine beach with literally no one else in sight (I will give you the nearest city-Yachats- and leave the rest up to you!) and we ended off the day viewing the sunset from the top of some sea stacks. That night we set up camp in the dark (an adventure itself) underneath towering Northern California redwoods. Road trips give you an opportunity to make new memories while spending lots of quality time with friends, family, or partners. Our first full day in California was filled with expected stops. After checking out of our KOA campground, we ventured through a forest of Redwoods. The temperature kept climbing and we realized this was a perfect opportunity to find a swimming hole. Sounds easy enough since we were in a forest, but it was a lot harder than expected. After asking for directions in a small town and not being able to find the location, we were ready to give up. The towering redwoods are so huge that you can fit inside of them! As we continued driving we spotted a river through the trees and followed it until we could find road side access. Through a bunch of redwoods so big I could fit inside of them there was a quiet and slow enough moving river for a swim. We spent time cooling off and enjoying the peacefulness around us. That night we stayed with a friend in Sunnyvale, and had a story to tell about the refreshing river we had had all to ourselves. Sometimes the unexpected places end up being the best! The river was so clear and so quiet! We could have stayed there for hours! Arguably the best part of a US West Coast road trip is being next to the ocean. By the time you reach California, depending on the time of the year, it is sometimes swimmable. After grabbing breakfast in Menlo Park we headed back to the coast to reach Carmel-by-the-Sea. If you have never heard of it, you are not alone. It is a quiet gem located between busy Santa Cruz and the better known Big Sur. You never know what to expect in Carmel. Sometimes we have been there and the whole town is covered in sea fog. Sometimes it is cold and cloudy. This day it was just perfect! It was sunny, the water was fairly warm and the tide had created a wide and shallow pool further up on the beach. We enjoyed our time soaking up all the sun, and Mason frolicked in the waves for what seemed like forever. In the afternoon we dropped Mason off with a dog sitter and headed to nearby Point Lobos State Reserve. The crystal clear China Cove and the abundant wildlife are good enough reasons to check it out, but there are so many different trails to discover at this preserve. China Cove in Point Lobos- that is not all seaweed, there are seals lounging on the beach! We ended off our day in the best way possible: visiting McWay waterfall at sunset and camping at Kirk Creek Campground, in a site located on the top of a large cliff overlooking the ocean in Big Sur. If you’re looking for amazing scenery on your West Coast road trip, make sure to spend some quality time in Big Sur. A stretch of Highway 1 located between Northern and Southern California, it offers some of the state’s best views. Carmel-by-the-Sea is the cutest town ever! The sea fog in Big Sur clearing! After experiencing sea fog in the morning, we decided to head back to Carmel to eat breakfast. After it had cleared we set out to explore as much of Big Sur as possible on Day 5. We stumbled upon a film set on one of our “secret” beaches, and met the producer of what would become the hit miniseries “Big Little Lies”. We stopped every few minutes at lookouts, peering over the dauntingly high cliffs. And we finally found the purple sand beach we had tried to find the year before. The purple sand beach was foggy but so cool! Big Sur never disappoints. That night we camped at an inland campground, Plaskett Creek, located in a forest next to a river. As the sea fog rolled in for the night we were treated to an eerily beautiful scene as a full moon rose above us. What is a road trip without music? There are so many songs that are tied to specific memories for me, and a lot of those memories are of being on road trips. Day Six was filled with a whole lot of unintentional driving. We woke up in Big Sur, and visited our favorite colony of elephant seals in San Simeon before completing that drive. While driving past Santa Barbara we made a hasty decision to detour through Los Angeles. At 3 PM. On a week day. Worst. Idea. Ever. The only thing that got us through hours and hours stuck in LA traffic and that got is through getting lost in less than desirable neighborhoods was our entertainment. We finally made it to Huntington Beach after hours and hours in the car! A well deserved sunset after a crazy day! California Gurls reminds me of the first time I visited LA with my best friend, and the OC theme song reminds me of the time my sisters, my husband and I belted it out while crossing the border into California. On an otherwise disastrous day of our road trip, music was there for us. And it always is on road trips. It is the constant on the sometimes monotonous highways that get you to where you’re going. Road trips give you the freedom to go wherever your car will take you, whenever you want. The next few days were filled with unplanned activities, which are sometimes the best kind. After the wasted day we woke up in beautiful Laguna Beach, after camping at Crystal Cove State Park. Except that it was not all that beautiful that morning. Considering we were in Southern California, the weather was downright terrible. It was drizzly and cold. Our plans to swim on one of Laguna Beach’s beaches seemed thwarted. It did not ruin our day though. We headed to dog friendly Huntington Beach instead, to let Mason swim. To our surprise the water was warmer than it looked! We got our swim in after all! We had achieved what we had come all the way to Southern California for, and we could now start heading home. Happy to be swimming at Huntington Beach! After making it all the way back to the Bay Area, we woke up in Sunnyvale again. The plan was to visit the Winchester Mansion, which we had seen in 2013, but at the last minute Adrian suggested we try something new. So we headed to the Computer History Museum in San Jose (Adrian is a computer programmer!) It turned out to be a really cool museum in which somehow the creators made learning about computers really engaging and fun! Sometimes the things that are unplanned end up being the highlights of a trip, simply because there is no expectation for them. We ended our adventure on a different note than expected, but a memorable one. Our last morning started in the forests of Shasta, Northern California. We spent the day driving back to Seattle, which was exhausting. It was made much easier because the USA is an easy country to road trip in. Who loves road trips more? Us or Mason? I have road tripped in Canada, in multiple countries in Europe and in New Zealand, and I can say with the utmost confidence that the USA is the best place for road trips. The infrastructure is well put together and maintained, so you never have to worry about getting lost in the middle of nowhere, or not having access to a certain place. There are rest stops at regular intervals and there is always a gas station close by. You will never go hungry even if you forgot your food, because there are handy signs on the highway showing you where you can find something to snack on. The USA has built such a culture around road trips that it is very easy to hop on the bandwagon and join yourself! If you’re just starting out and have never taken a road trip, the US West Coast is the absolute best place to start. It is not remote enough that you will have to worry about getting stranded, and it gives you the most amazing views! Road trips involve views like this! Road trips are something that everyone should try at least once in their lives. If you’re looking for adventure, a road trip is for you! I’m actually doing a US west coast road trip in a month and I’m so pumped! I hope you enjoyed it!! West Coast, Best Coast! Thanks for reading! It really is an amazing trip, I hope you get a chance to do it soon! I love a good road trip for so many reasons! We were just in Oregon this spring. I have pictures in front of the exact same haystack rock! Oregon is so underrated, it is GORGEOUS! I have not explored much inland, but the coast is so quiet and empty and beautiful! This is awesome! I’m also based in Seattle and have been trying to figure out how to road trip with my little kids when they get a bit older. I think we may need to do a road trip through the Oregon coast to test it out! I definitely need to do a trip like this soon! I used to live in Southern California but it’s been a long time since I’ve been back. The West Coast is gorgeous! It is a really beautiful route to take, and Southern California is beautiful too! I love your reasons! The pictures are all so wonderful and it looks like ya’ll had a lot of fun! I also love that your pup was able to tag along! Thanks!! We had tons of fun, and our dog Mason probably has more fun than us on those road trips! He gets to swim so much! What a great trip! I love that your dog was able to go with you! How beautiful, driving the west coast is a bucket list item for me. It looks amazing! It really is amazing, I hope you get to do it as soon as possible! Lol at Cape Disappointment! Thank you for writing this post! I think my husband and I are looking into roadtripping and camping along the coast from Seattle down through Cali during the fall, so this is absolutely perfect! Yeah, I was very skeptical when I first heard the name! Thanks for reading, I hope you have an awesome time when you do make the trip! Aw, this makes me miss home. I completely agree that road trips through the western US are the best! And, I’ve never heard of purple sand beach…that is so cool. I searched for it on multiple occasions before we actually found it, it is kind of hidden off a small dirt road. They really are the best! Love this! Such stunning photos, and your dog is adorable 🙂 I’ve had a west coast road trip on the top of my list for too long, hope to get there soon! Thanks! Mason knows he is pretty cute and uses it to his advantage lol. I hope you make it here soon, it is an amazing trip to do! We always have an amazing time doing this trip! Thanks so much, I know you will enjoy it! Awesome post! This is a road trip I have yet to take, but it’s definitely on my list! I already know that nasty LA traffic will need to be avoided, I cannot stand it! LA traffic is the WORST! I hope you get to take this trip soon, it’s a beautiful trip! This is a great itinerary of a west coast road trip! Your photos are absolutely amazing and make me want to jump in the car right now! Thanks so much! You SHOULD just jump in your car and go! We take a 30-day road trip every July and love being able to see all these new places. We have yet to do the west coast but it is on our bucket list! Thanks for sharing! Oh if I had 30 days to do this trip I would be one happy camper! You will have a blast doing this route! We travel in our RV full time!! Need to check out these destinations! This would be a perfect trip to RV! Instead of a tent you can just RV in the parks with an even cozier view! Thanks so much! The West Coast really is the best coast!!! I love all the pictures! This looks like an amazing trip, I will remember this post when planning our trips for the summer! Thanks, we loved the trip as well! It is an awesome summer trip! Your photos are amazing, and your dog is just too cute!! 🙂 <3 Great post!! Thanks, he definitely knows it and uses it to his advantage haha. Thanks so much! What beautiful scenery! I have seen a lot of the California coastline but none of the Oregon one. Lovey! I had seen a lot of California and only visited Oregon for the first time in 2015. I was blown away and keep returning over and over again! It’s on our travel bucket list to do a road trip like this!! Can’t wait to make it happen some day! I can’t wait for you to do it! You will absolutely love it! Your road trip sounds fabulous. We drove from Portland down the Oregon coast to the Redwoods. One of my favorite trips! I’ve done that shorter one too! It was great until at the Oregon California border it started raining and did not stop for the rest of the trip! Bad weather or not it is a special trip! Can’t wait to come out and do a road trip with you four. I have a specific one in mind for you- from here to Tillamook and then maybe a bit further down the Oregon Coast! I love Cape Lookout! Such a beautiful spot to camp! It really is! I think we have camped there three or four times now, and try to return each Summer! Great post, amazing pictures. You are basically living my dream. Thanks! That is such a compliment! Oh my goodness, this looks like such an incredible trip! I did a similar road trip last summer but did Phoenix up to Napa and then back and absolutely loved camping out in the Redwoods. Such a beautiful and peaceful area. The Redwoods are insanely beautiful! Your road trip sounds like a lot of fun too! Yay PNW! The coast here truly is gorgeous! You should post about navigating the floods of California that one time!! Will do soon! That was an insane trip! Can you believe we’ve been to California together three times now?! Wow, I don’t think I have ever seen pictures of the Oregon coastline. It’s so beautiful! A lot of people haven’t! It really is beautiful!